One of my good friends, Robin Robins, operates a coaching/consulting/training company to help managed service providers (the guys who fix your computers and manage networks for companies) with their sales and marketing. Once a quarter she assembles her Producers Club members for a meeting. Robin always invites me to her meetings. I usually will carve out time to hear the main presenter. 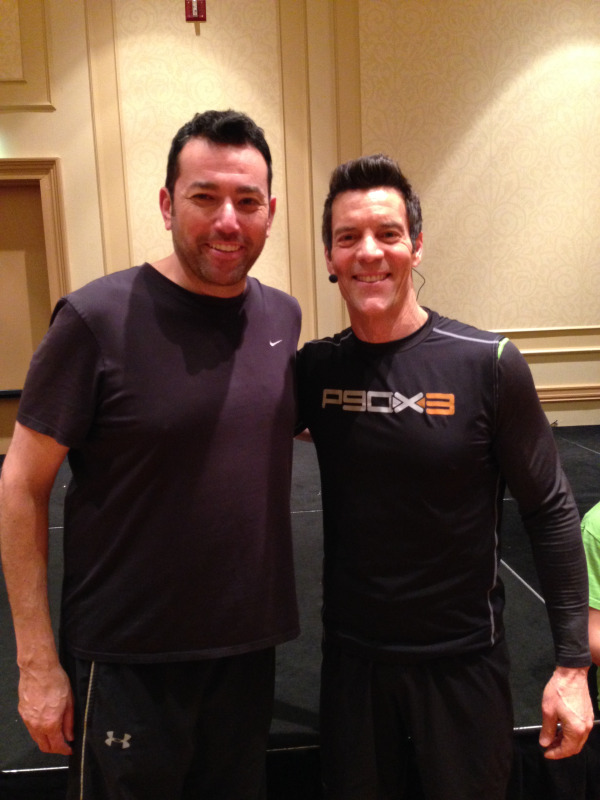 Last week’s meeting featured Tony Horton, the P90X guy. I was able to chat with him at a private cocktail reception and attended a P90X class he put on for Robin’s group. After the workout, I had my pic taken with him (see below) and heard him address all two hundred attendees. Based on our private conversation and what he shared with the entire group, here are some points we can all benefit from. Be open to course corrections. Tony went to Los Angeles to become a star. His agent recommended he get in better shape to land roles. Before long he was in killer shape. He still is at 55. While doing odd jobs for a Hollywood exec, he was asked by his boss to get him in shape. He did such a great job getting his boss in shape, that he was asked by celebs like Tom Petty, Sean Connery and Shirley McClain to train them. His training business led him to work with the head of Guthy Renker, the infomercial giant. That led him eventually to P90X. What opportunities are sitting in front of your face? It takes multiple products to make a profitable company. P90X has sold half a billion dollars worth of DVDs. Are they profitable? I would guess marginally so. The real money is made in nutritional products sold on monthly subscription. They’re also testing meals shipped to your door. Just about every business has a front end and super profitable back end. My restaurant made a decent profit. It was the catering that made us a ton of money. Test, Test, Test. Infomercial companies know a boatload about testing. They test different offers, stories, testimonials, etc. Only by changing variables can you find the winning formula. The first year out P90X was marginal. During that first year, clients sent in before and after pics and videos. Those home made testimonials caused the product to skyrocket in year two. I never promise someone a get rich quick fix, but trying out different catering marketing strategies will help you discover the ones that work for you. I may never have a six pack and look like Tony Horton at 55, but his lessons will help me out the rest of my life. As you start 2014 focused on your new goals, please keep them in mind.